Scuol Switzerland Railway Station – 05, originally uploaded by andynash. One of my favorite places in the world, Scuol Switzerland. 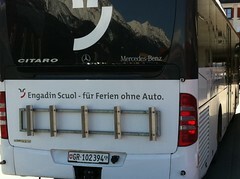 You don’t need a car as this photo shows … it says: Engadin Scuol – for vacations without cars! More photos of the Scuol Railway station, a wooden bridge and the great food we ate on my flickr set: Scuol Switzerland.